HP7R colors (also available in black). Illustration courtesy of Coast Products, Inc. There are more flashlights on the market than fleas on a dog. The biggest question facing buyers is no longer, "How many lumens does it put out," but "What are its features and how good is the quality?" Most of the newer units on the market are equipped with CREE LEDs and put out between 200 and 1,000 lumens. However, caveat emptor applies more than ever. Unfortunately, many LED flashlights are so poorly constructed as to remind one of the low quality products that came out of Japan right after WW II. (Back then, we called it "Cheap Japanese junk," but now it is "Cheap Chinese junk." -Editor) Naturally, none of these units are ever tested to ANSI/FL1 standards. With this in mind, what do you look for in a quality flashlight? First, make sure it is tested and rated to ANSI/FL1 standards. ANSI/FL1 standard requires that the light withstand repeated three meter drops on hard surfaces and still function. This simulates the accidents that one would expect to encounter in everyday use. The machined aluminum case of the HP7R is virtually indestructible. Next, it is desirable the flashlight has a focusing capability. While it may be useful to flood an area with light, it is frequently desirable to be able to tighten the beam to increase the light's distance and enhance the details of the target. The Coast HP7R meets both of those criteria and more. The 300 lumen output is more than adequate for the majority of uses and its long range focusing feature is superior to anything else on the market. There are a lot of lights which claim to focus, and they do, but only at short range. The HP7R permits focusing all the way out to its 1154 foot maximum beam distance. To be able to pinpoint an object at long range is a real benefit, whether you are a camper, hunter or backpacker. Just slide the front bezel to focus the beam between flood and spot. You can lock the beam anywhere you want. Twist left to lock the beam in place. Twist back to the right to release. The HP7R has a low power setting to extend battery life when its maximum brightness is not needed. Using a lithium battery pack the run time is seven hours on high output (300 lumens) and 33 hours on low output (30 lumens). There is also an emergency strobe light setting. You can cycle between full light, strobe and low light options with the push of a button. You can even have your HP7R in your favorite color. The HP7R is available in black, red, blue, green and burnt orange and a nylon belt pouch in included. With all of the above qualities we almost forgot to mention one of the best features: it is rechargeable! The lithium ion battery can be charged directly by turning the tail-cap and pulling it up to expose the Pro-Tek USB charging port. To ensure that you always have a charged battery, Coast includes two lithium ion battery packs and a AAA battery cartridge with the light. As one might expect, AC and DC adapters are also included. You can keep this light charged whether you are at home, or in your vehicle, or use replaceable AAA batteries. 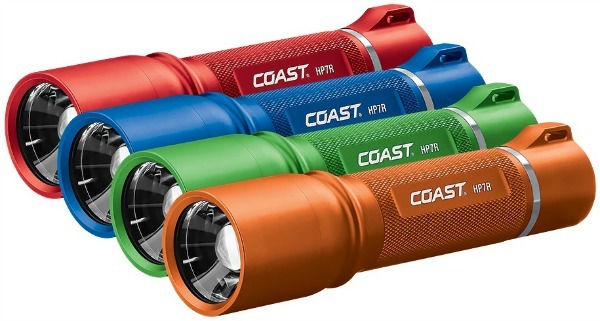 Given the optical features and quality of this flashlight, plus the extra goodies that Coast has included, the 2018 MSRP of $140 is a reasonable price. When you consider the HP7R has a lifetime warranty (materials and workmanship) for the life of the original purchaser, it is a good price.